Drexel professor George Ciccariello-Maher has been put on administrative leave after receiving multiple death threats over tweets he sent out after the Las Vegas shooting. 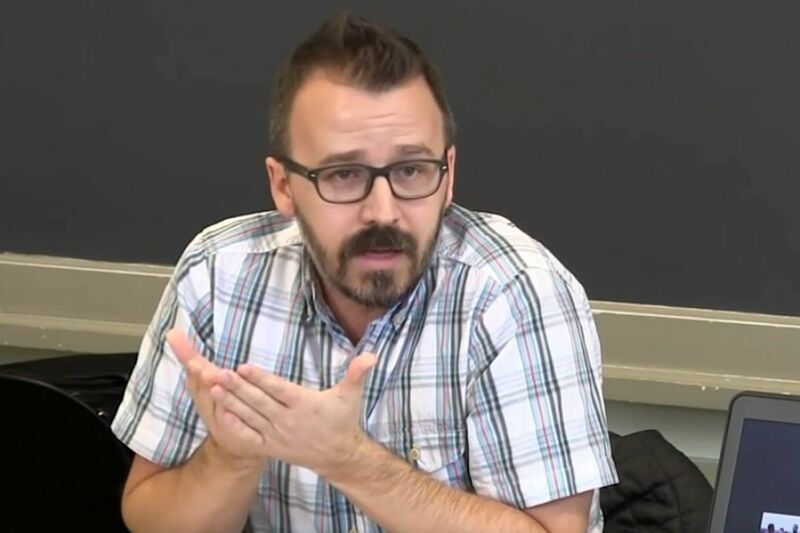 George Ciccariello-Maher, an associate professor of politics and global studies, drew the ire of many right-wing news sites after claiming "the narrative of white victimization" was behind the deadly shooting in which 58 people were slain and nearly 500 injured. "White people and men are told that they are entitled to everything," Ciccariello-Maher wrote in a series of tweets attempting to explore why so many mass shootings are carried out by white men. "This is what happens when they don't get what they want." Ciccariello-Maher didn't just go after conservatives; he also attacked liberals for their push for stricter gun laws in the wake of the tragedy. "To believe that someone who would shoot down 50 people wouldn't circumvent any gun law you pass is the height of delusion," Ciccariello-Maher wrote, claiming that both the gun lobby and supporters of gun control are "racist as [expletive]." After initially noting that Ciccariello-Maher's social-media comments "are his own opinion and do not represent the university's views," Drexel said it made the decision to put him on leave to protect students, faculty, and staff after a number of threats were received by the school. "Due to a growing number of threats directed at Professor George Ciccariello-Maher, and increased concerns about both his safety and the safety of Drexel's community, after careful consideration the university has decided to place Professor Ciccariello-Maher on administrative leave," Drexel said in a statement. "We believe this is a necessary step to ensure the safety of our campus." The university would not elaborate when asked. The professor's comments were first picked up by the right-wing news website the Daily Caller, where they spread like wildfire across other conservative news outlets like Breitbart News, Glenn Beck's the Blaze, the conspiracy-theory website Infowars, Turning Point, and the controversial pro-Trump Reddit page r/The_Donald. In an op-ed Tuesday in the Washington Post, Ciccariello-Maher said that his comments eventually ended up on Fox News, where the network mischaracterized his thoughts to suggest he blamed both President Trump and the victims of the shooting. "He's clearly commenting on the president of the United States and the American voters by saying, essentially, 'Because they voted for Donald Trump, then this is the reason why this happened,' " TheBlaze TV reporter Lawrence Jones said on Fox Business. "The narrative of white victimization has been gradually built over the past 40 years," Ciccariello-Maher wrote. "It is the spinal column of Trumpism, and most extreme form is the white genocide myth." Once his comments went viral across conservative media outlets and social-media networks, the professor said he was quickly inundated with hate mail from angry readers that included homophobic slurs and death threats. "Many called me a 'cuck' — a favorite racial and sexual insult of the alt-right — while others urged me to move to North Korea or Venezuela," Ciccariello-Maher wrote. "One 'love note from a WHITE American' wrongly identified me as a 'greasy South American a‑‑hole.' "
Ciccariello-Maher said he didn't agree with Drexel's decision, writing that it curtails the academic freedom of his students and sends the wrong signal to "racist internet trolls" who use threats of violence to control free speech. "Such cowardice notwithstanding, I am prepared to take all necessary legal action to protect my academic freedom, tenure rights and most importantly, the rights of my students to learn in a safe environment where threats don't hold sway over intellectual debate," Ciccariello-Maher wrote in the op-ed. Ciccariello-Maher has a history of making controversial statements on Twitter, sometimes along racial lines. Last Christmas, in response to the outrage over a State Farm Insurance ad that showed a black man proposing to a white woman, he created a firestorm of his own with an eight-word tweet on Christmas Eve that he said he intended as satire: "All I want for Christmas is white genocide." Then, in March, Ciccariello-Maher temporarily turned his Twitter account private due to the criticism he received after a tweet about an airline passenger giving up his seat for a uniformed soldier went viral. Some guy gave up his first class seat for a uniformed soldier. People are thanking him. I'm trying not to vomit or yell about Mosul. As in this latest incident, Ciccariello-Maher said reactionary right-wing news outlets purposely took him out of context then to alter his point, which was to criticize the military over our country's endeavors in Iraq. "I respect anyone who makes difficult and dangerous decisions out of economic necessity — whether they are public school teachers, construction workers, economic migrants, or young soldiers," the professor said at the time. "What I don't respect is a brutal invasion and occupation of Iraq that has not made our world any safer — a war that has taken advantage of economically disadvantaged Americans, a war that has given the world ISIS, and a war that has wrought carnage like that seen in Mosul and elsewhere."